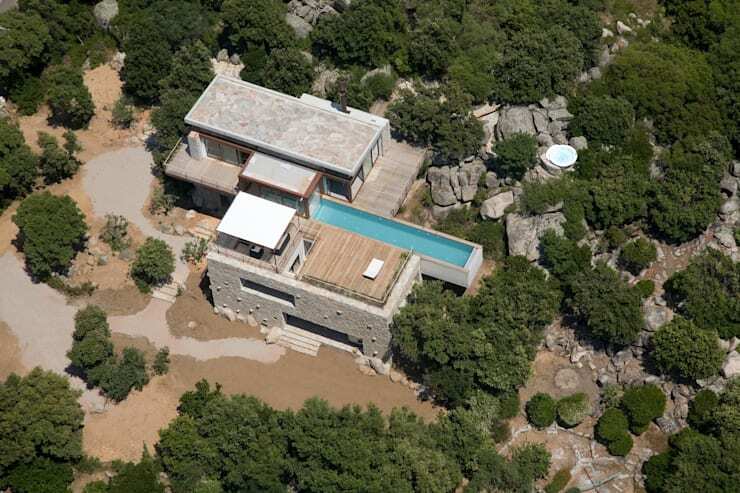 This sublime mountain estate was built in Sainte Lucie de Porto Vecchio in France by architects Vezzoni Associes. Yet the nature-inspired texture, the pool design, and grand luxurious deck would feel right at home almost anywhere in Canada. The splendid ocean outlook would suit the East or West coast, or maybe even lake properties in Ontario, the Okanagan or Quebec. If you're building a house that intends to capture fantastic views then you'll want to take a tour of this home with us for some inspiration. 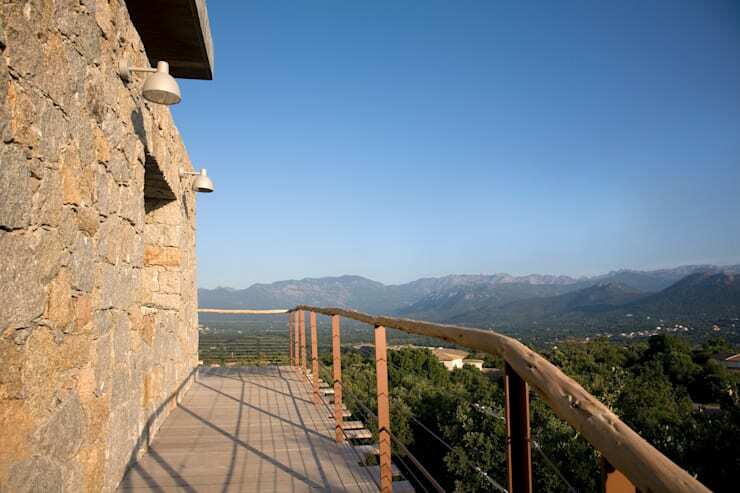 From its perch on the mountain top, this home has a stunning view of the ocean and some beautiful islands. Who wouldn't want to wake up and head out to that fantastic view? Picture grabbing your morning coffee and settling into one of those classy modern chairs on the deck to watch the sunrise. This would also be a fantastic entertaining space in the evening, with the huge pool and long deck. This bird's view of the house is stunning. 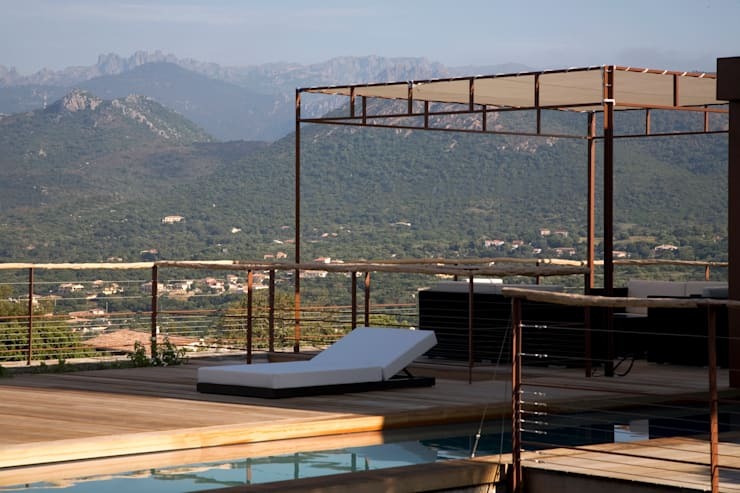 We can see how incredible that swimming pool is, jutting out onto the mountain terrain below. 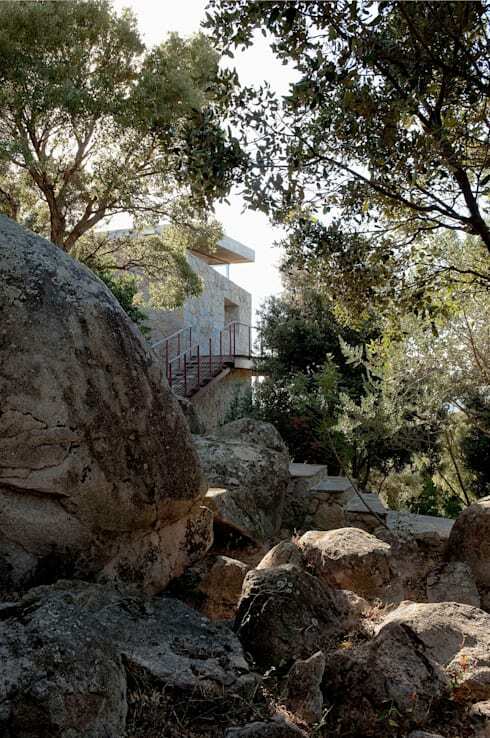 While most of the surrounding landscape is rocky and green, we can see that one side of the house is sandy and open. Clearly the architect has taken these surrounding textures and incorporated them into the house . 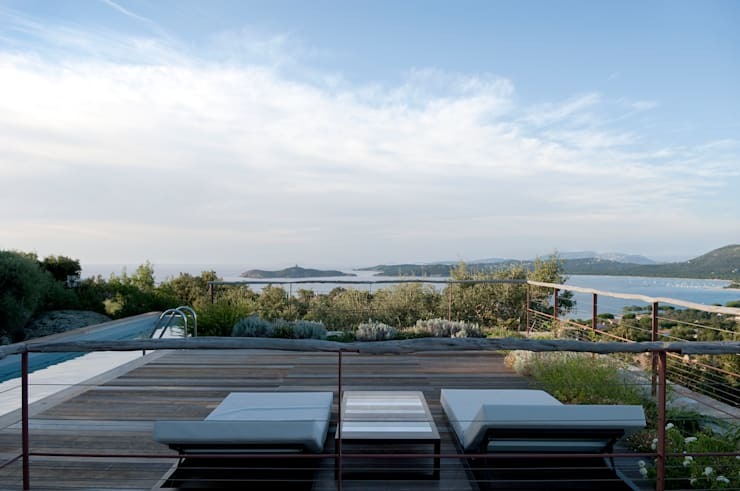 The highest roof is the same texture as the gray stone, the wooden deck panels match the sandy surroundings, and ,of course, the pool mirrors the ocean. All of these earthy blends keeps the house in tune with its landscaping, making for a natural feel that doesn't detract from the splendid vistas around the house. 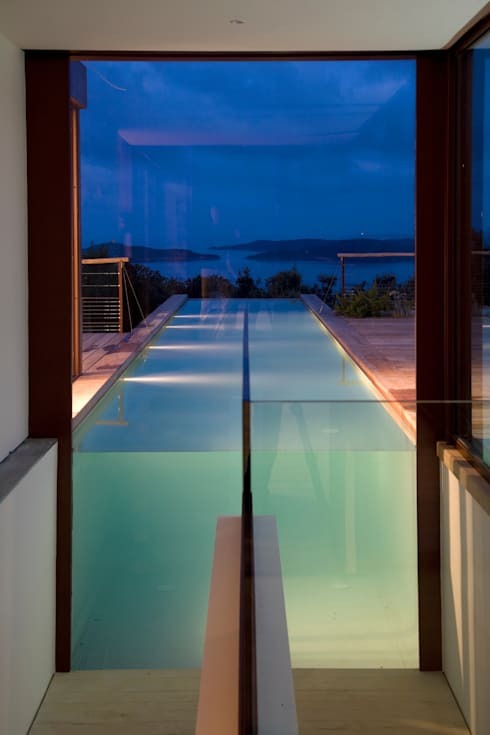 This evening peek at the far poolside demonstrates exactly how the architect planned out the swimming pool to feel continuous with the ocean. If you're taking a dip in this moonlit paradise you can still see the ocean, and likely feel its breeze and smell the salt air. What a refreshing swim. If you want to see some other beach inspired homes you'll love this hidden house that also takes advantage of some lovely scenery. This shot taken from the opposite side of the deck reveals even more splendid views. From here, you see the gorgeous French Alps, and the foothills in front really dramatizes the scale of the mountains. The architects have taken care to make sure this view is never obstructed, with a charming brown awning to block sun and rain. The rail pattern on the awning matches the side railing of the building, and this simple design doesn't detract from the main spectacle. If you're loving this terrace, or the modern seating, you'll want to look through some of our balcony inspiration. Here again are those amazing mountains, but we also have a new view of the side of the house. This walkway really takes advantage of the fantastic location. And there again are natural texture, the stone walls, keeping the house in tune with the mountains and making it seem fortress-like. The railing here appears to be made out of recycled timber, especially from its realistic texture. What a nice touch to bring the feeling of those grand woods right to your fingertips while you stand above the canopy. The walk up to this house is a steep but splendid climb. The rocky exterior on the south side of this building also matches those gray boulders in the surroundings. It looks like some of the stairway has also been carved out of the stone, emphasizing that natural vibe. It's incredible that the canopy of trees also makes the space feel quiet and secluded from this angle, even though the house is in such a grand location. We have a whole host of landscape architects who could help you achieve similar peaceful surroundings for your home. How have you made the most of your pool and deck? Let us know in the comments!